Hello stamper! Welcome to PCC246 Paper Craft Crew Sketch Challenge! Of course you know I just HAD to use some of my pre-order products from the new catalogue! I am just LOVING this new Colourful Seasons Bundle! It’s always a good idea to purchase the stamp set and thinlits together when offered as a bundle; in this case the Colourful Seasons stamp set and Seasonal Layers Thinlits Dies. You get terrific coordinating products, AND you save yourself 10%! Starting with a Whisper White cardstock base, I added 2 panels from the Colour Theory Designer Series Paper Stack; the first in the Daffodil Yellow ombre, then a smaller panel in the Dapper Denim, set off to the right side. Using the Seasonal Layers Thinlits for the Adirondack chair, I die cut the shape form a piece of the Wood Textures Designer Series Paper Stack. The Big Shot with the Precision Plate make it really easy to cut this detailed piece. 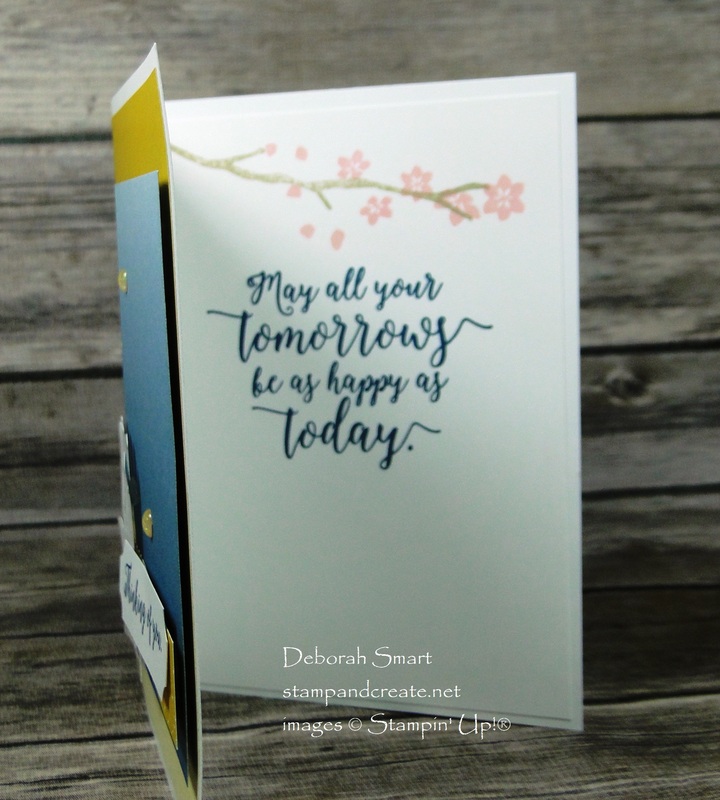 The sentiment is from the Colourful Seasons stamp set, inked in Dapper Denim onto Whisper White cardstock. I used my 1/2″ Circle Punch to snip off each of the corner, then layered all of the pieces together. Finishing off the card are a few of the new Glitter Enamel Dots (I’m going to have to order more of these – I’m using them on everything!). Of course you have to stamp on the inside panel, too! This lovely sentiment is stamped in Dapper Denim ink. The branch and flowers are also from the Colourful Season stamp set; I used Crumb Cake and Blushing Bride ink pads. You’ll be able to order these NEW PRODUCTS on Thursday, June 1st! Our ordering system will be down for transition to the new catalogue on June 1st until 11 am PST – then you’re good to go! Just click on either the images below, or my signature, to order online. I love the colors you used on this card. They match my cottage! Such a serene card. Deb I too love this bundle and your card is stunning. The way you’ve used the color theory paper is breathtaking.